Rashidun Nabi Bhuiyan is a member of the Ansarullah Bangla Team militant group, banned by the authorities. He was arrested on October 16 , he now unexpectedly says he is “sorry" for the murder. The blogger Nazimuddin Samad was punished for criticizing radical Islam on Facebook. 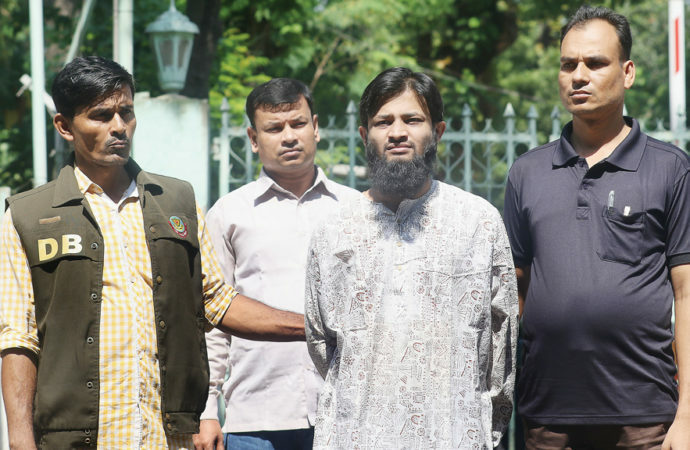 Dhaka (AsiaNews) -Anti-terrorism agents have arrested an Islamic extremist who last April led the assault and murder of blogger Nazimuddin Samad, punished for expressing democratic ideas and criticisms toward radical Islam. Then in a totally unexpected twist Rashidun Nabi Bhuiyan, a member of the Ansarullah Bangla Team militant group, banned by Dhaka, declared before the judges: "Please forgive me. We were wrong. We are sorry and we apologize to the nation". The arrest took place on October 16 in the vicinity of the Sayedabad bus station, a district of the capital. Investigators believe that the radical led the group of five killers who on April 6 approached Nazimuddin Samad, a 28 year old law student, and killed him with machetes and gunshots. He was murdered under the eyes of dozens of witnesses, who reported that during the murder, the killers shouted "Allahu Akbar" (God is great). From the outset it was clear that the student was punished for his views. His death has raised a wave of protests involving students of his university. The blogger had spoken out repeatedly against the extremist drift in the country and on his Facebook profile he wrote of "not belonging to any religion." He was born in Sylhet and was part of Ganajagaran Mancha movement, a movement for the rights of bloggers who work for the defense of free thought in Bangladesh and calls for the punishment of war criminals of the liberation struggle of 1971. According to his friends, he was a "courageous" free thinker. Investigators were on the trail of his murderers since August, when they discovered a silent cell in Dhaka. Adjunct Commissioner of the Metropolitan Police, Monirul Islam, said that militants have planned the murder for three months, and have been waiting for the right moment to catch him in the street. The arrested is collaborating with the agents by providing some names of accomplices. The Adjunct Commissioner, however, has curbed speculation adding: "We are checking the information and we will launch an operation to arrest his comrades".